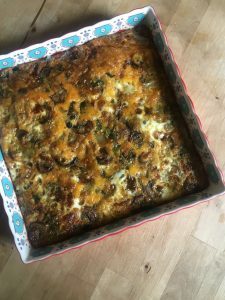 Veggie Loaded Egg Bake | Ridge's Stitches | Health Coach. Yoga. Clothing. You wake up to the sunlight trickling through the curtains. Your first breath draws in the scent of sundried tomatoes and garlic wafting through the air. Pure ecstasy. You smile to yourself because you know it is going to be a good day. There is something so grounding about the morning. Birds are chirping, the city sits still besides the paper boy tossing news to the neighbors (yes, this still happens), and the glisten of the morning dew on the plants just shows you how alive this world truly is. When you add a delicious breakfast to the mix, it just makes all the difference. This veggie loaded egg bake is one for the books. Let’s just make this morning even more electric with a side of bacon covered with a little salt and pepper. Make it ahead of time and just pop it in the toaster oven the next morning! Salivate, why don’t you? Preheat the oven to 400. Oil the sides of the baking dish. Whisk the eggs, salt and pepper and milk in a large bowl and set aside. Heat 1 TBSP olive oil over medium heat in a large skillet. Add the mushrooms and sauté for about 4 minutes until starting to brown. Add the onions, salt, and garlic. Cook for another two minutes. Add the spinach and allow it to wilt, remove from heat and set aside. Put black beans, tomatoes, and sautéed veggies in a baking dish. Pour egg mixture on top and bake at 350 for 45 minutes. Check with a toothpick at 45 minutes to see if egg bake is finished. If egg comes out on the toothpick, stick it back in the oven for another 3-5 minutes and check again. 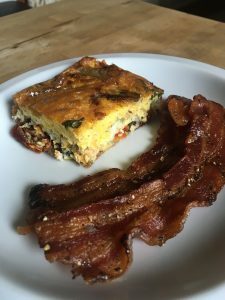 Enjoy with a side of bacon!